Homemade Dandelion Lotion Bars (& Dandelion Oil) - Oh, The Things We'll Make! 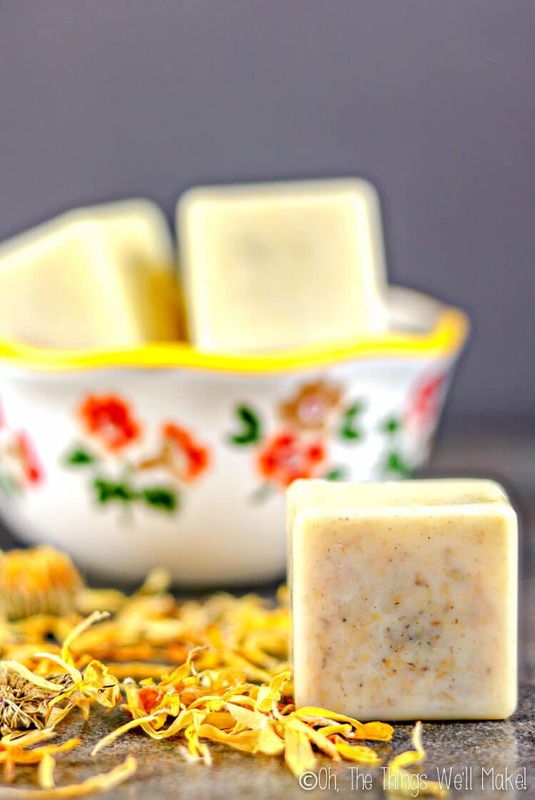 Made with an infused dandelion oil to sooth irritated skin, these homemade lotion bars are a convenient, non-messy way to moisturize your skin. Today I have a special treat for you. Lately, I've been showing you more complex recipes like how to make a homemade lotion or how to make a facial moisturizer recipe for acne prone skin. Those recipes aren't difficult, but they do need special ingredients. While many of you love making those sorts of recipes, others prefer to avoid using emulsifiers and natural preservatives. I completely understand that, as I was the same way for many years. To avoid needing to use emulsifiers and preservatives, we need to make recipes that only use oils and waxes and don't use any water based ingredients. In come lotion bars! A lotion bar is a type of solid lotion that is formed into bars for easy handling. The idea is to make something that almost resembles a small bar of soap, but it's really a nice, solid lotion that melts into your skin. Another great thing about lotion bars is that they are easy to apply for people who don't have great dexterity, like kids, who might otherwise make a mess when applying a lotion. I'm not saying that you should let your kids play with them without supervision, and it's still probably a good idea to help your kids apply the lotion bars, but they are quite convenient, especially if you make lotion bar sticks in deodorant type containers. How do you use a lotion bar? Lotion bars are formulated in a way that they are solid at room temperature, but that will begin to melt when warmed with body heat. They can be used at any time, but an ideal time is right after showering when your skin is normally warmer and ready for absorbing the oils in the lotion bar. You can first warm the bar in your hands a bit, and then rub the melting bar over your dry skin. It should absorb into your skin to help soothe and protect it. Today's recipe is for homemade dandelion lotion bars, and it's a recipe from Cari from Everything Pretty. Cari blogs about beauty for real women, health, and wellness. She shares a lot of DIY bath and beauty recipes on her blog, and loves using herbs and different carrier oils to create the perfect recipe. Most people look at dandelions and see weeds, but I see an ingredient for my DIY bath and beauty recipes. Dandelions are a wonderful plant for dry or cracked skin, including eczema. The flowers are high in vitamins A, B6, C, and K to help the skin. They also have magnesium, calcium, potassium, and phosphorus to help nourish the skin. By infusing the dandelion flowers with a carrier oil, you get the benefits of dandelions without actually using them in the recipe for a smooth solid lotion bar. Infusing the dandelions is easy, but it does take some time. Collect about two cups of dandelion flowers and let them dry completely. Place them in a mason jar and completely cover with a carrier oil. Let them sit for two weeks. Shake the jar every day to help the flowers infuse in the oil, but make sure that the flowers are always covered in the oil so mold doesn't grow. After two weeks, strain the oil through cheesecloth. Discard the flowers. You are left with a beautiful golden colored carrier oil that can be used in several different DIY recipes. You can use any liquid carrier oil. Avoid using coconut oil because it is solid at room temperature when temperatures are below 76ºC/24ºC. I used avocado oil because it's my favorite oil for dry skin. You can even use two oils if you want the benefits of each oil. Combine the beeswax, shea butter, coconut oil, and dandelion infused oil in a double boiler and heat over medium heat. Never heat the oils over direct heat. I make a double boiler by setting canning rings on the bottom of a pan and putting a glass container on top of them. Stir occasionally until everything is melted. The beeswax will seem like it will never melt, but it will melt after about 15 or 20 minutes. Once it's melted, carefully remove from heat. Pour into molds and let sit until completely cool. Depending on the size of your mold, this could take anywhere from half an hour to a few hours. The lotion bars should pop right out of the mold. If they don't, put the mold back into the freezer for a few minutes and try again. Hi, I had 2 good sized jars of dandelions soaking in oil and I had to go away for 2 weeks. On my return I found there was mold on the tops of the jars, could you please advise if I can scoop it off and still use it for balm, or should I just throw it away? That’s a tricky question. I tend to be of the type that does just scoop it off and use the underneath part, but it depends on the oil and the appearance of the mold. I’m not sure how sound it is to recommend others do the same, though. I often use coconut oil, so it’s solid and pretty easy to separate. With liquid oils, it’s not so easy to know. What does your mold look like? I tend to toss anything that has black mold, especially if it’s “hairy.” I’m a lot more laid back with fluffy white molds, for example. Thank you for the amazing recipeee! Hi! I wanted to share this recipe with my class(for our yearly science thing) and I can’t find dandelion oil where I live in. I also don’t have time to make it. Is it possible to use sunflower seed oil instead? And if so, how much should i put? Hi Tracy and Merry Christmas from Leesburg, GA! I made these lotion bars for my granddaughter. She had requested some shea butter to battle her eczema on her hands so I wanted to do something a little nicer than just shea butter melted and poured into a jar. I was delighted with the end results. I didn’t have time to infuse some avacado oil with dandelions because it’s very cool here in south GA so all the dandelions are gone until next summer. I substituted some lovely grapefruit and orange essential oil giving them a pleasant citrus scent to match the yellow from the shea butter. I used a square silicone treat mold so the cubes are a perfect 2-inch square. They popped right out of the mold with no problem. I packaged them in a nice little tin with a personalized label. Thanks for posting the recipe! I’m sure she will enjoy them. I’m so happy you liked them. Yes, there is no need to use the dandelion. It’s just an idea. You can infuse all sorts of different plants or you can just use essential oils. Just note, be careful with the citrus oils when you put on your skin before going in the sun- especially in the summer there in Georgia! Hope you’re having a wonderful Christmas! Instead of using dandelion infused oil, could I use rosewood essential oil or peppermint? If so, how much would you recommend? Also, would it be beneficial to add vitamin e oil? If so how much? Thank you so much for sharing these recipes! As for adding Vitamin E- it has antioxidant properties, and it’s a great addition to products with oils in them because it helps keep the oils from going rancid quickly. Normally you’d add vitamin E at around 0.5% of the recipe. Again, in this case, it’s a bit tricky to calculate. I’d probably just add a couple of drops. You don’t want to go overboard because too much Vitamin E can actually work against you- and instead of protecting the oils, it can make them oxidize more quickly. I hope that helps! Tracy, Thank you so much for getting back to me so quickly. I didn’t know that too much Vitamin E can oxidize oils more quickly! I’ve learned so much useful information from reading your blog. You are such a blessing! This was a guest post, so I didn’t make these myself, but I’ll try my best to answer with my personal thoughts. I think the bits you see in the lotion bars aren’t actually flowers, but just the little bits of flower material that weren’t completely removed when the macerated oil was strained. Because this is an oil based product, if you are using these in a dry environment, the tiny bits left over probably won’t be a problem, especially if you make sure the flowers are fully dried before you start the maceration process. That’s why Cari didn’t use fresh flowers, but completely dried them before infusing the oil with them. If you use these in the shower, and have large enough petals left over that get wet during use, then, yes, I could see it being a problem between uses. It’s all about how well the flowers were dried to begin with and the way you use your lotion bars. If there is any plant material left over, I’d be careful about not getting it wet when you use the lotion bars and you should be fine. Tracy, thanks so much for then information/reply. I put my flowers in oil today after drying them 1 day. They seemed dry so fingers crossed it turns out 🙂 Cannot wait to try it. I made the lotion bars in little Dole fruit cup containers yesterday without the flowers added and they are awesome. I did add the 2 teaspoons of avocado oil plain without the flowers oil. The look like little flowers because of the fruit cup container. So cute! Thanks for posting. I didn’t know about lotion bars, thanks Tracy, learned something new today!